And I want to sort it by date. I have tried allDataRange.Rows,but I got the same result. And then I try the allDataRange.Rows,the result is same.It seems it can not be sort by row? It seems that the function sort by column works good. I'm really puzzled on it.Why does it work so mysteriously? Someone has answered this question but now remove it.Thank you here. I get the idea and tryallDataRange.Sort(allDataRange.Rows, Excel.XlSortOrder.xlDescending, Type.Missing, Excel.XlSortOrder.xlAscending, Type.Missing, Excel.XlSortOrder.xlAscending, Excel.XlYesNoGuess.xlNo, Type.Missing, Type.Missing, Excel.XlSortOrientation.xlSortRows,Excel.XlSortMethod.xlStroke,Excel.XlSortDataOption.xlSortNormal,Excel.XlSortDataOption.xlSortNormal,Excel.XlSortDataOption.xlSortNormal); but it prompts a syntax bug. 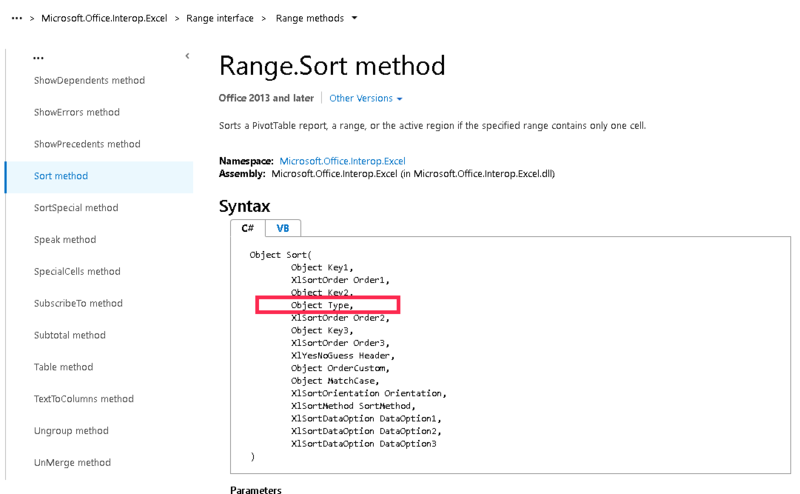 I have checked document from How to: Programmatically Sort Data in Worksheetsand Range.Sort method,but I can't find the error. Browse other questions tagged c# excel or ask your own question.